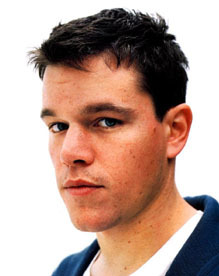 At about age ten Matt Damon became inseparable from another kid who lived two blocks away -- Ben Affleck. Damon & Affleck played baseball together, attended discount double features, and went to the same school. Both boys were interested in acting, and both worked as extras when Field of Dreams filmed a few scenes at Fenway Park. Damon also appeared in several plays at the American Repertory Theatre and other Boston-based theatre venues. Pursuing thespian dreams, Damon & Affleck slipped away to New York when Damon was 16. Success eluded them, and Damon returned home and went to Harvard, where he studied drama and took small roles in more movies filmed locally. When Damon landed a large role in Geronimo: An American Legend, a big budget film by Walter Hill, he moved to Los Angeles, and Affleck tagged along. But the movie flopped, and Affleck ended up sleeping on Damon's couch for years. Damon first garnered some critical acclaim as a troubled Gulf War veteran in Courage Under Fire, but for the most part both actors were getting only small or silly roles. Damon, frustrated, re-read a script he had written for a college class, about a genius janitor sweeping the halls at MIT. They tinkered with the screenplay, and after having William Goldman (Butch Cassidy and the Sundance Kid, The Princess Bride) polish the dialogue, they sold it to Miramax, and Good Will Hunting was a hit. Damon and Affleck co-starred, and won the Oscar for Best Screenplay. After Good Will Hunting, Damon and Affleck appeared in several films together, did joint interviews, interviewed each other, and seemed as tight at 30 as they had been at 10, leading to rumors that they were a couple. They apparently made a conscious decision to stop appearing in films together, which further hurt Affleck's career. Damon, meanwhile, has made several successful films, including Saving Private Ryan, The Talented Mr. Ripley, Stuck on You, The Departed, The Bourne Identity, Supremacy, and Ultimatum, and Oceans Eleven, Twelve and Thirteen. Damon and Affleck are executive producers of Project Greenlight, an HBO series spotlighting their "Project Greenlight" contest, wherein one aspiring moviemaker sees his or her script filmed as a low-budget movie. The winning films include Stolen Summer with Kevin Pollak, The Battle of Shaker Heights with Shia LaBeouf, and Feast with Balthazar Getty. Hollywood Walk of Fame 26-Jul-2007 at 6801 Hollywood Blvd.